Formidable Colonial architectural design of almost 4,000 sq. 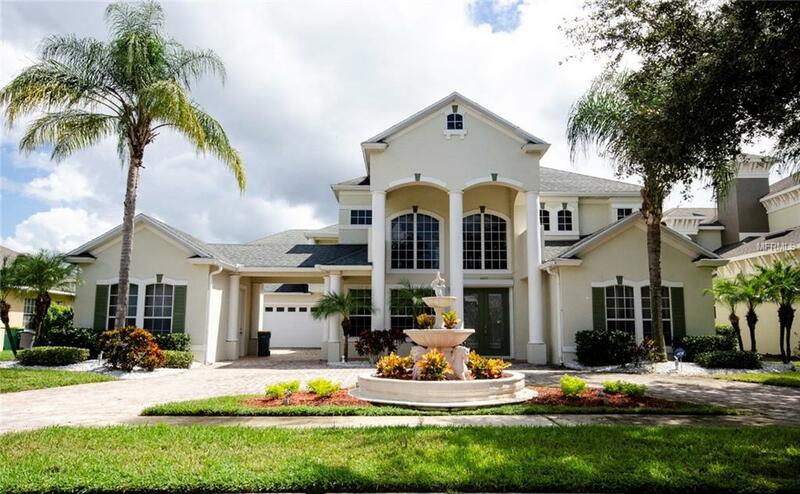 ft. with 5 bedroom, 4.5 bath, in an exclusive Private Gated Golf and Waterfront Community. This beautiful home offers on the main floor a remodeled Master Bedroom with 2-walk in closets, fireplace, jacuzzi, and sauna. An open floor plan with vaulted ceilings, formal living, and dining room. Enjoy the gourmet style kitchen with stainless steel appliances, large walk in pantry and wet bar, a picturesque in-ground pool with spa & surrounding patio. The upstairs features a large bonus room with wood floors and double doors that open to a large balcony with a spectacular lake view all around. There are 2 additional suites with stunning lake views and a suite converted into a theater. This home comes with an electric generator, hurricane shutters and solar panels! Great location just minutes to major roads, theme parks, and Orlando International Airport! These are only some of the features this stunning home in Kissimmee Bay has to offer, so come and see it yourself before it's too late!